Floor slab with incised lettering in Roman caps and lowercase. Long s used. Broken across middle. 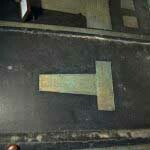 A stone Floor Casement painted black upon which is set a figure brass with brass border. 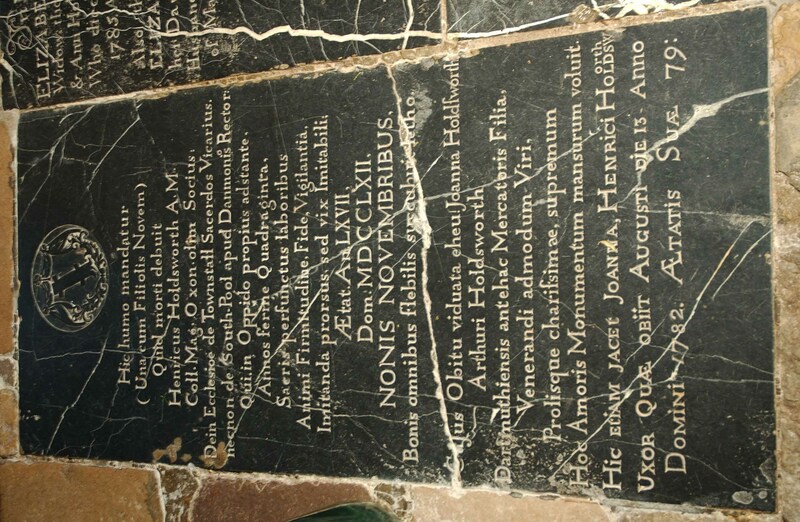 The border is partly missing but indent survives and is incised in Roman caps with a short description and date of death. The brass is represented as a single female figure having a heart shaped head dress with ruff over partlet. A gown with farthingale and embroidered front piece and round toed leather shoes. 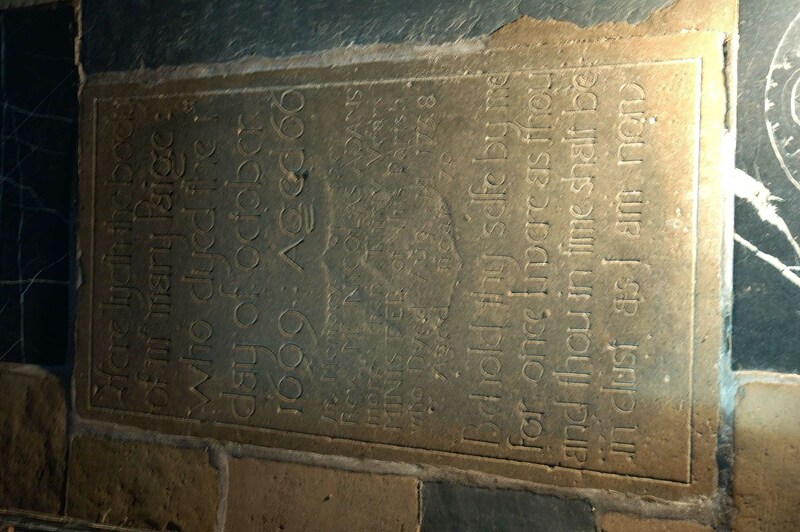 Beneath her is a rectangular brass plaque inscribed with verse in incised Roman caps ,some archaic spelling and with V for U. 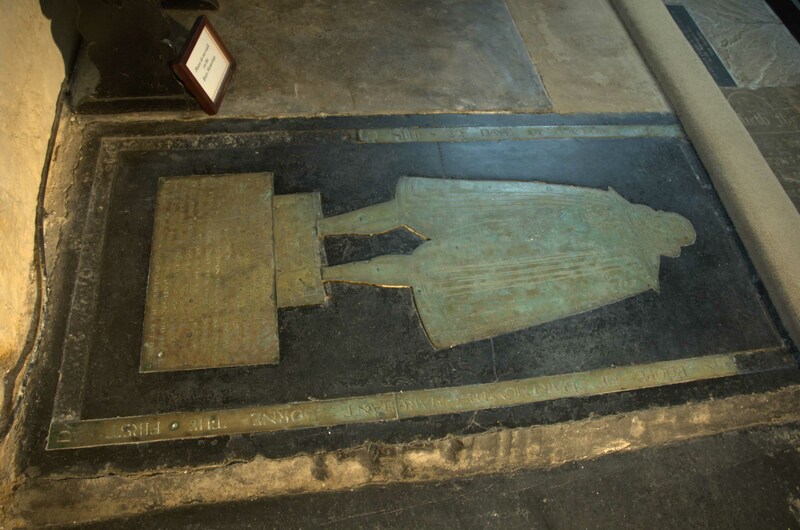 Separately and below are two unevenly shaped brass elements representing her two sons as male figures and four female figures representing her daughters. 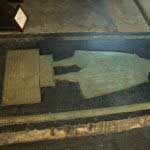 It seems probable that the brass has been re-laid and may have been re positioned. 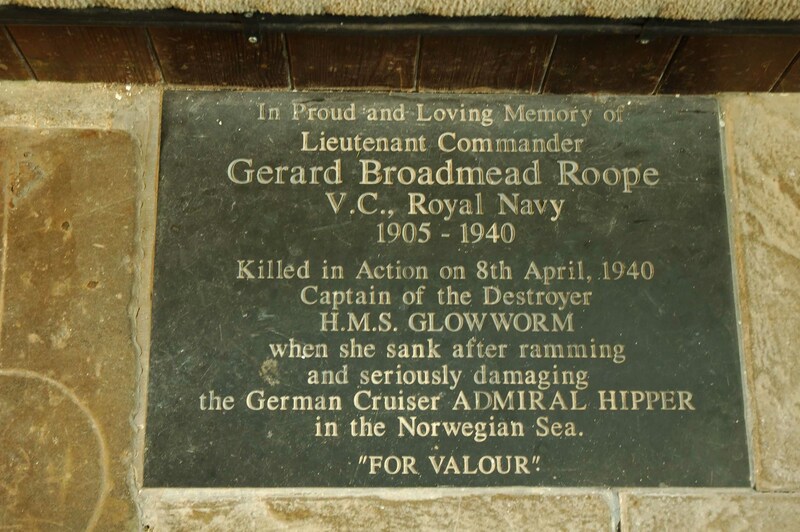 Note the difference in the spelling of Plumleigh on the border and in the inscription. 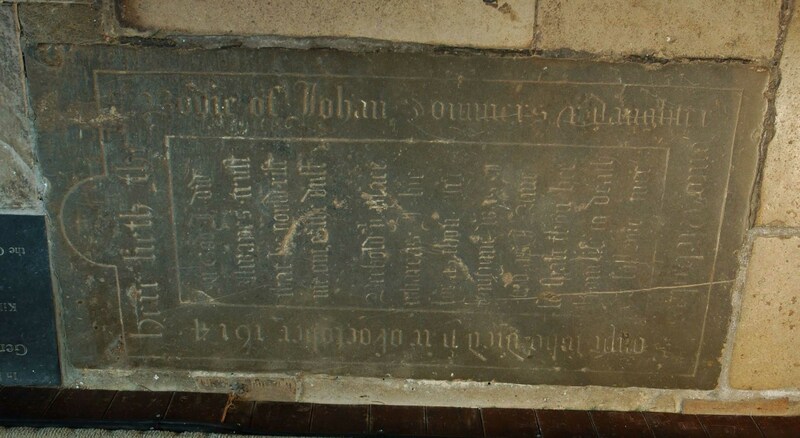 Border: HERE LYETH THE BODYE OF / BARBARA THE WIFE OF JOHN PLVMLEIGHE OF DARTMOUTH/ WHO…./THIRD DAYE OF SEPTEMBER ANNO DOMINI 1610. 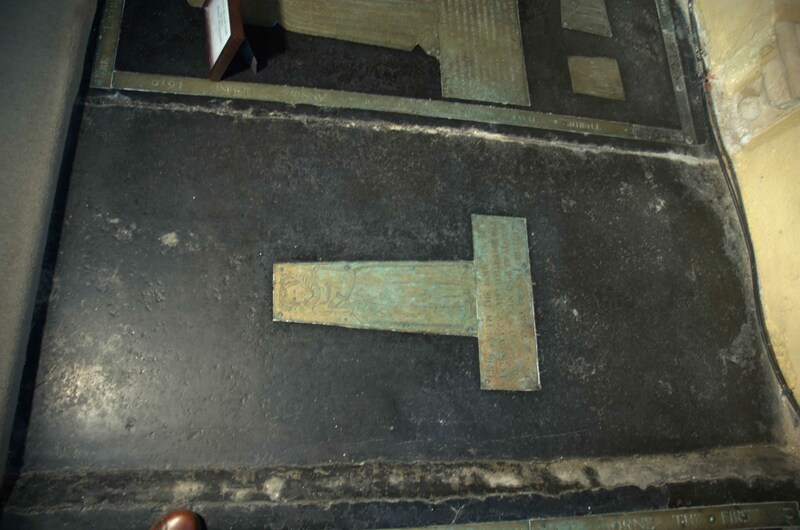 A rectangular stone casement with a brass positioned centrally on it, the brass in two pieces and together shaped as an inverted “T”. Eight studs in each brass along edge. The upper part containing an engraving of a single female figure wearing a heart shaped and decorated headdress, a ruff, partlet, a gown with farthingale carrying a large ribbon bow at front and having leather shoes. Hands folded in prayer. The lower brass is inscribed in Roman caps. Some archaic spelling. No trace of enamel. 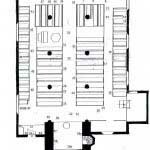 Possibly re- positioned in church and casement may not be original. 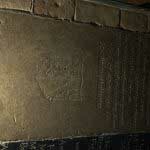 A rectangular stone casement with a single male figure in brass placed centrally over a rectangular brass tablet with inscription all surrounded by a brass inscribed border. Part of border missing and indent apparent. 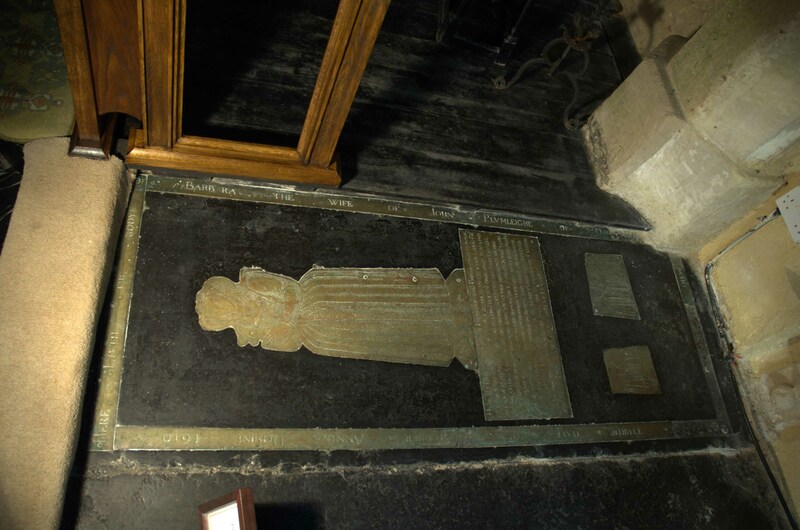 Young male figure in brass shown above rectangular brass but in front of a rectangular representation of a chest. Figure dressed in ruff, shirt cuffs showing short doublet with breeches and merchants cloak with leather shoes. Hands folded in prayer. Bareheaded but showing a full head of hair. Inscriptions in Roman caps. Some archaic spelling. 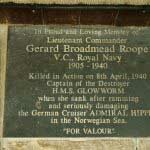 Brass may have been relaid or repositioned. Border brass part missing but indent remains. 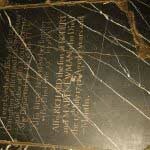 Rectangular Black marble floor slab with white veining and lettering in Roman caps and l/c. Incised eight pointed star at either side of lettering at head. Damaged and split in two pieces. 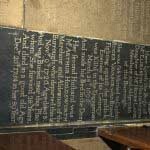 A rectangular floor slab in buff coloured limestone with border inscription and central memorial inscription in incised Gothic caps and l/c. Long ʃ used. 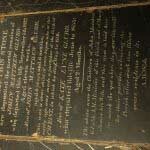 The border inscription is set between two parallel incised lines with a nowy head. Face of tablet very worn. 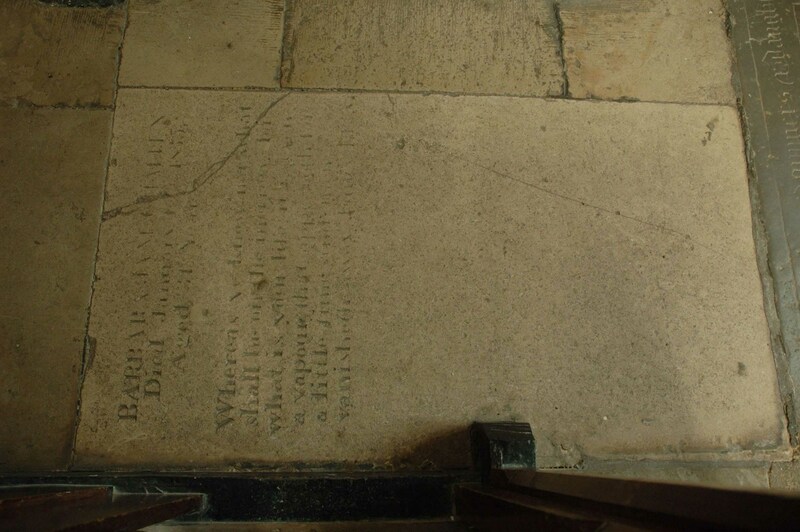 A rectangular buff limestone Floor Slab with lettering in incised gothic lettering. 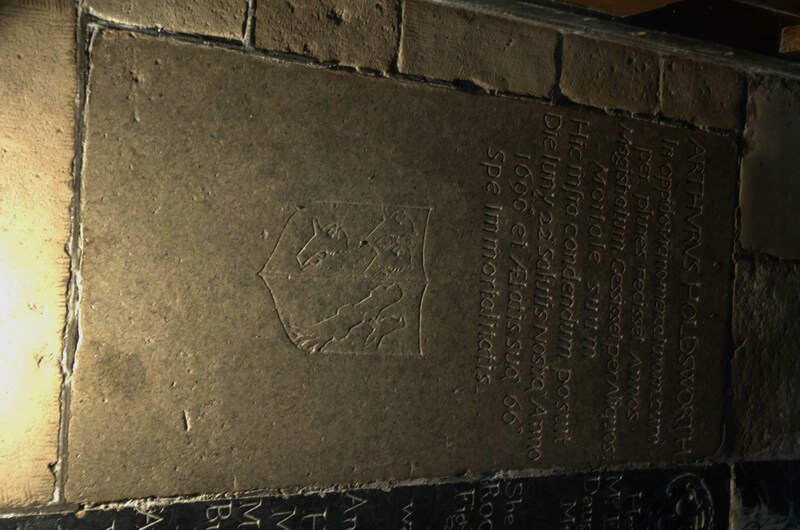 The slab is cracked at head on the south side and from the middle on the south side to the foot. 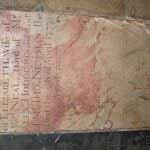 Very worn lettering across the middle and the north side eliminating the ends of the last lines of verse. A rectangular buff limestone Floor Slab with incised lettering in Roman caps and l/c. Feint crack from head to foot. 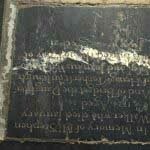 A black slate Floor Slab with inscription in Roman caps and l/c. Long ʃ used. 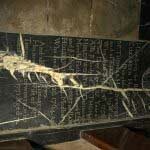 Very badly damaged and partly obscured by the bench raft. 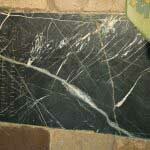 A rectangular stone slab in black marble with white veining. 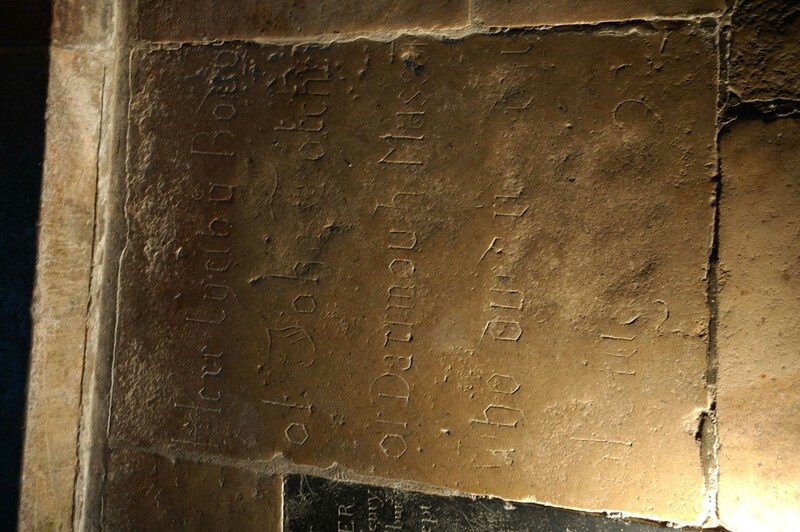 Lettering incised in Roman caps (The first Memorial inscription being in larger caps than the remaining ) and l/c. Damage to the outer edge at top and foot. Inner edge of stone occluded by bench raft. 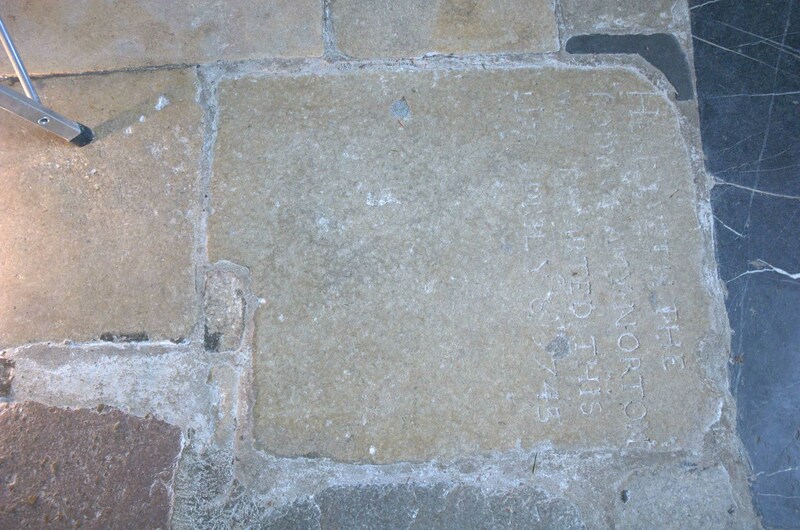 A reused stone as part of the aisle floor appearing to have been cut from a larger floor slab with feint unreadable incised Gothic script caps and l/c. 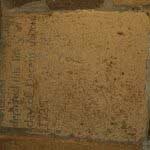 A square buff stone slab with only the letters “M B” remaining. Incised in Roman caps and l/c. 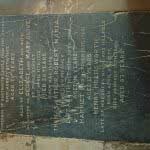 A black marble rectangular Floor Slab with inscription in upper half in incised Gothic script header and remainder in Roman caps and l/c. 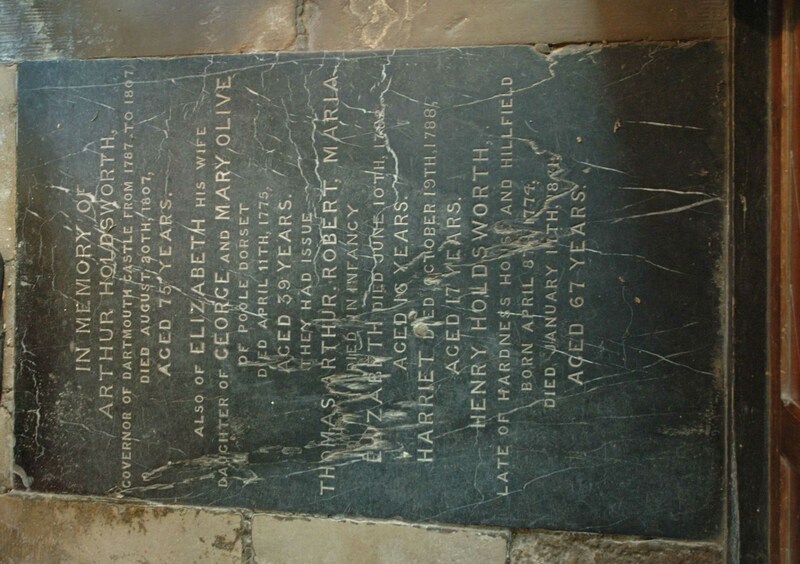 A rectangular black marble slab with some white veining and with a v cut incised inscription in roman caps and l/c and having a roundel at the head with the Holdsworth family achievement. Cracked across the mid centre of the slab. Some mis-spellings. Blazon The shield set within mantling suspended on three rosettes and with acanthus scrolls below. 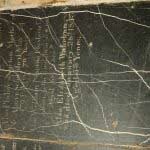 A rectangular black marble slab with white veining with incised inscription in roman caps and l/c. 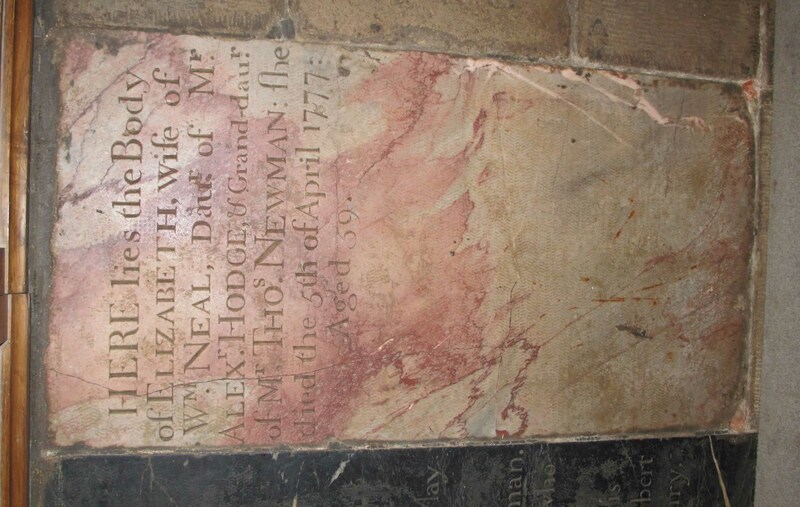 A rectangular stone slab incised with the arms of the Newman and Holdsworth family. At the foot the inscription is incised sans serif caps and l/c. 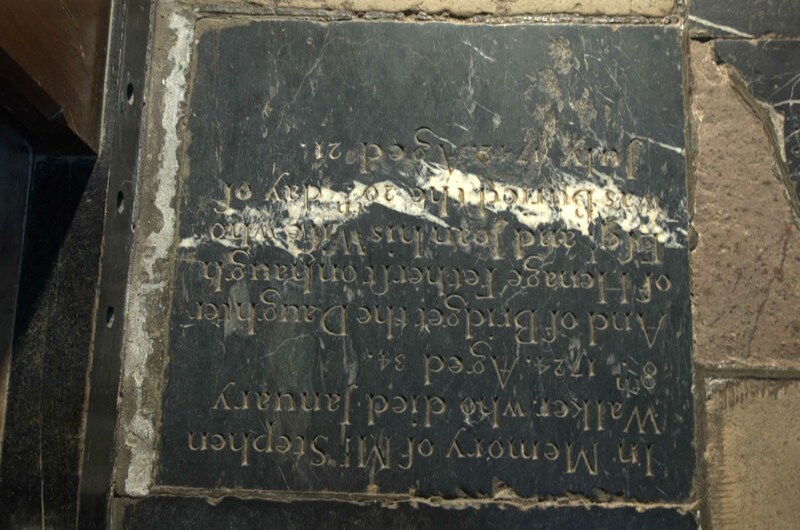 Latin Translation: Arthur Holdsworth, when he had acted as a merchant in the neighbouring town for several years and conducted his magistracy for some years, placed his mortal remains to be buried here below, on 22nd day of January in the year 1690 of our salvation and in the 66th year of his life, in the hope of immortality. On a wreath above an esquire’s helm from which issues mantling is the crest: a cockerel. 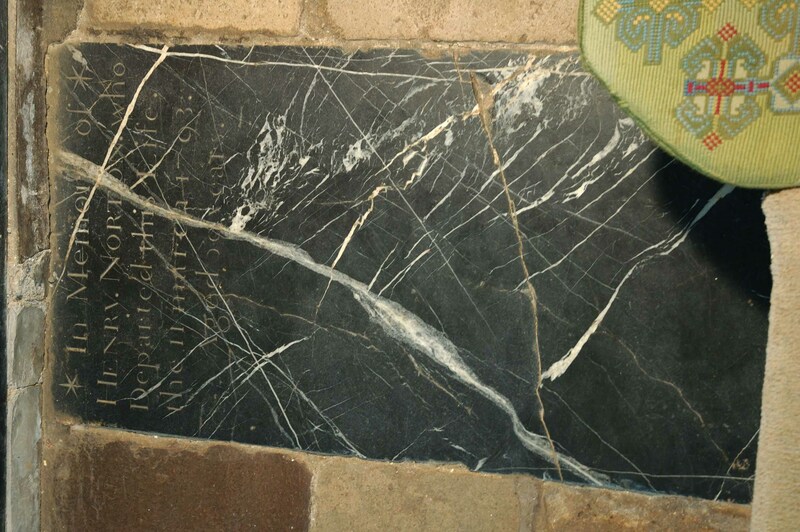 An oblong stone Floor Slab, possibly cut from a rectangular original in black marble with white veining and incised lettering in Roman caps and l/c. Long ʃ used. 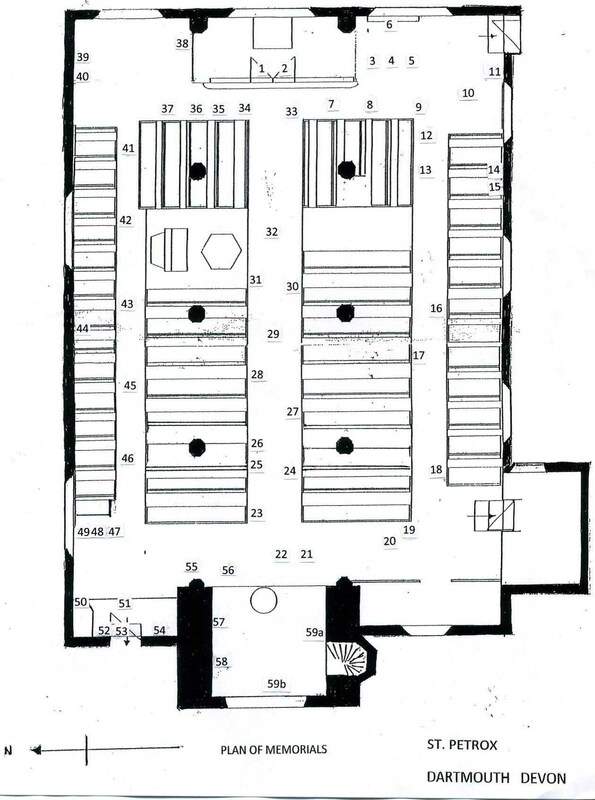 A rectangular black marble and white veined Floor slab with a nowey head with shoulders, the head border incised with a half concave sided hexagon pattern and having a centrally placed incised achievement above a small oval sun ablaze. 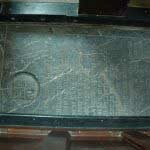 The slab has lettering incised in roman caps and l/c. 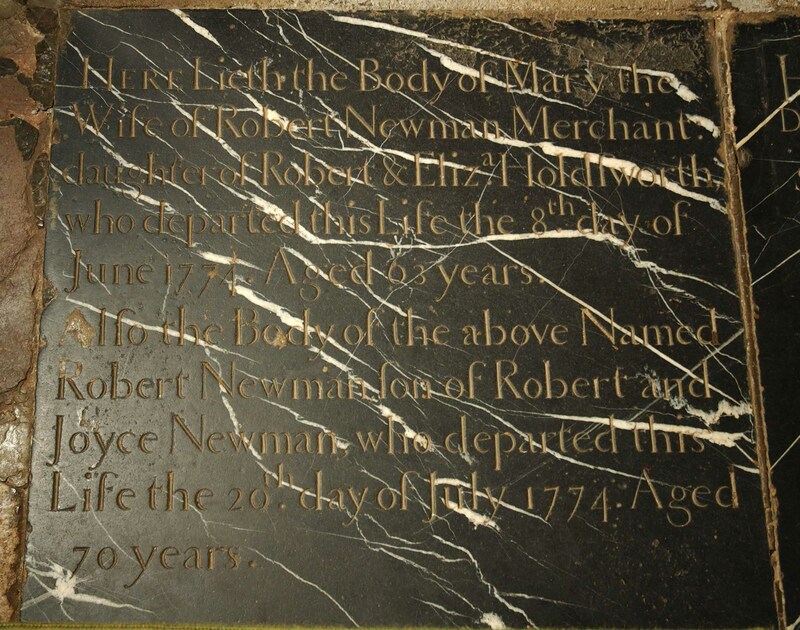 Here Lyeth the Body of/HAYMAN LEIGH /He departed this life the 10 of July/AD 1780 in the third year of his AGE. A rectangular black marble and white veined slab with lettering to the upper half in incised Roman caps and l/c. Long ʃ used. 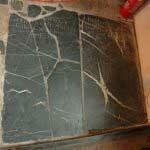 A slate floor slab in very damaged and worn condition. 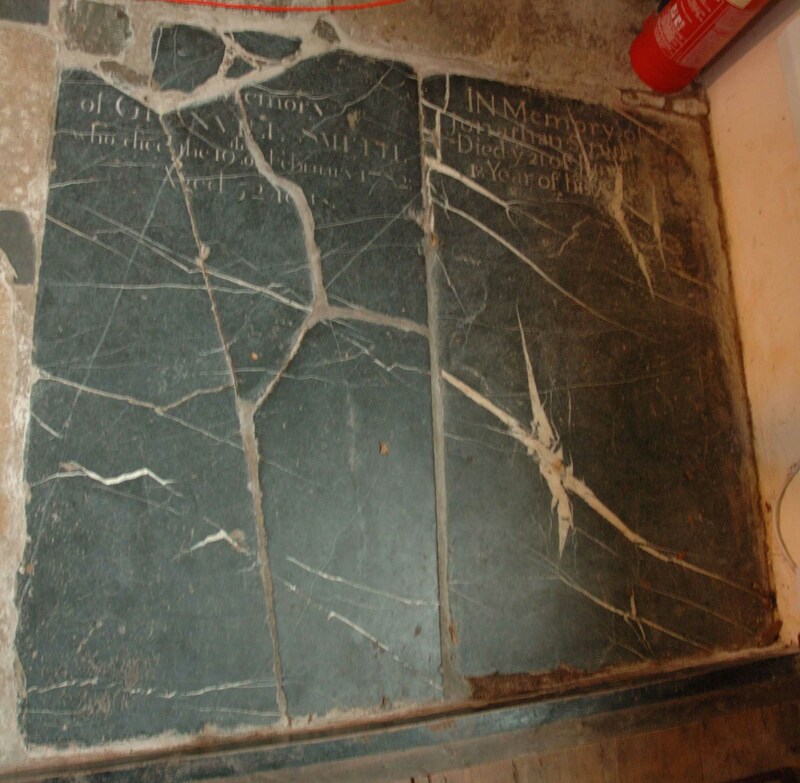 Lettering mostly missing particularly at the left hand side of the Slab but indicating memorial to three persons in incised roman caps and l/c. 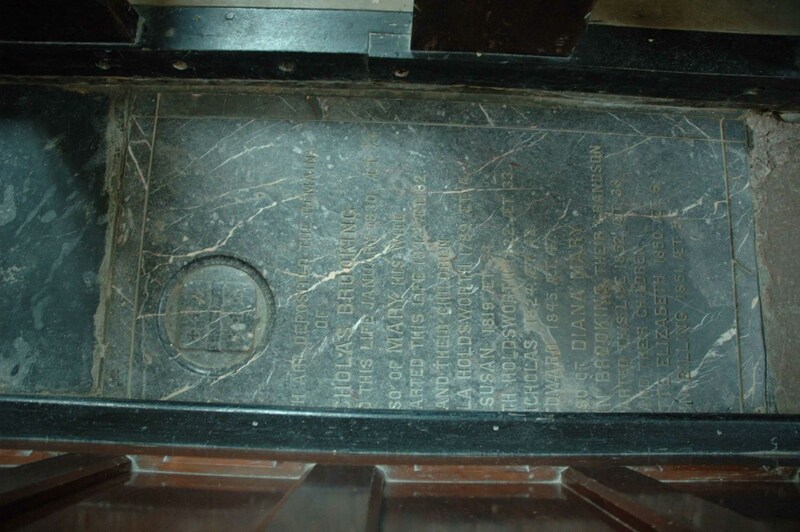 A rectangular black marble and white veined slab with a lozenge set within a roundel which is surrounded by a scrolling cartouche. The roundel containing arms of Weston and Newman at head and description in incised Roman caps and l/c below. Long ʃ used. 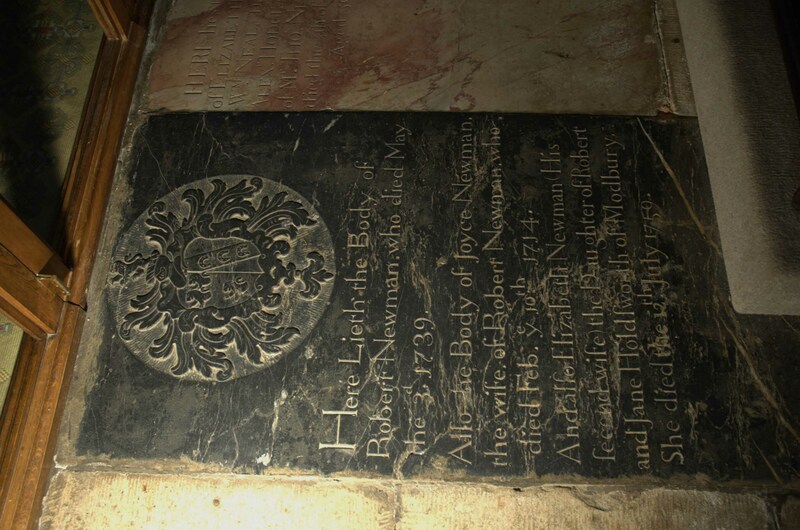 An incised veined and coloured pink and white marble Floor Slab with decoratively incised lettering in gothic script with long ʃ used and ornate “E”, the principal memorial recorded in a surround with lettering facing inwards and the memorial of the second inscribed within rectangular incised lines and below the incised Newman family coat of arms itself incised within the form of a lozenge. 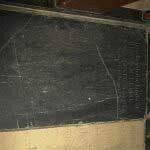 The whole partly obscured at the west side of the head by a bench end. 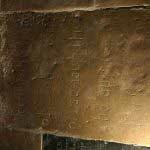 ‘H’ of ‘Here’ being decoratively incised. An esquire’s helm with mantling issuing terminating in rope and tassels, and wreath above, but no crest. 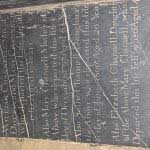 The Principal memorial: Here Lyeth…/..ohn Newman of Dartmouth Merchant/ who dyed the VI/ day of Aprill 1640. And Ellen his wife./ who Dyed/Eighth day of /1662. 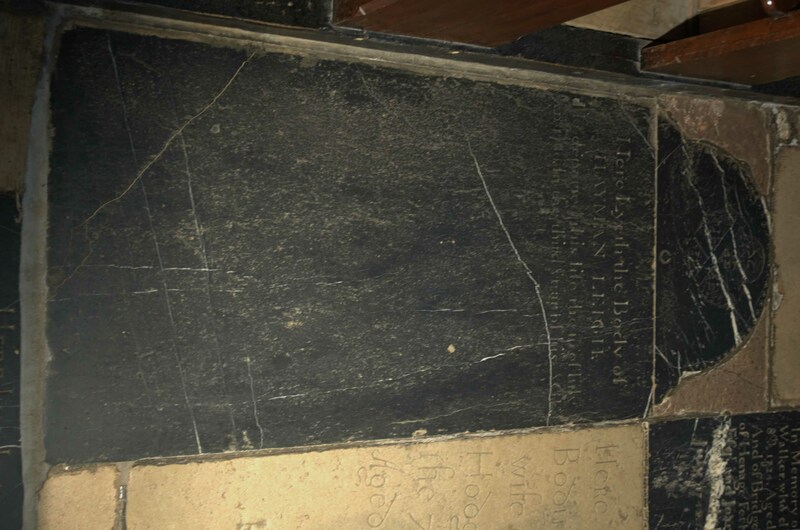 A rectangular black marble floor slab with inscription in gouged incised Roman caps and l/c. Damaged across the lower part by a crack from lower half of N edge to mid foot and repaired with cement. 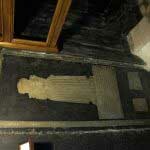 The Sanctuary raft oversails the foot of the slab. 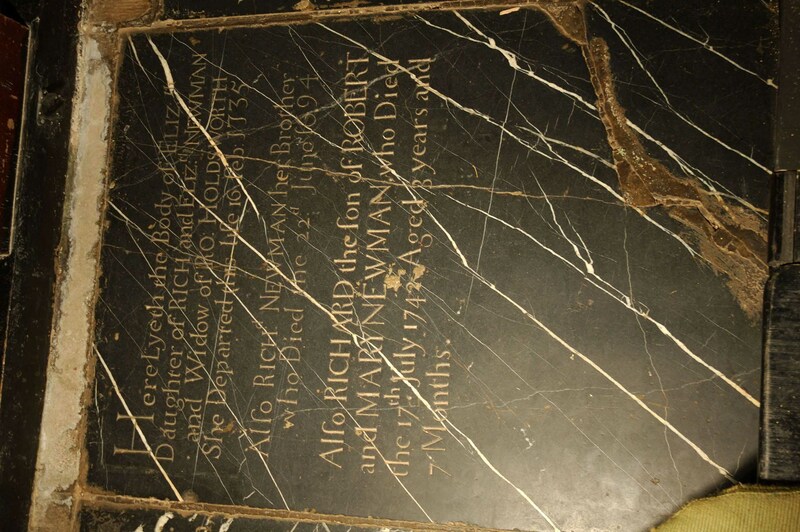 The latter part of the inscription for Richard and Mary Newman is inscribed in slightly different lettering to the former and may have been added at a later date. 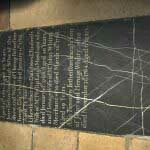 A rectangular black marble floor slab with inscription in sloped and italic incised Roman caps and l/c. Slightly chipped at edges. 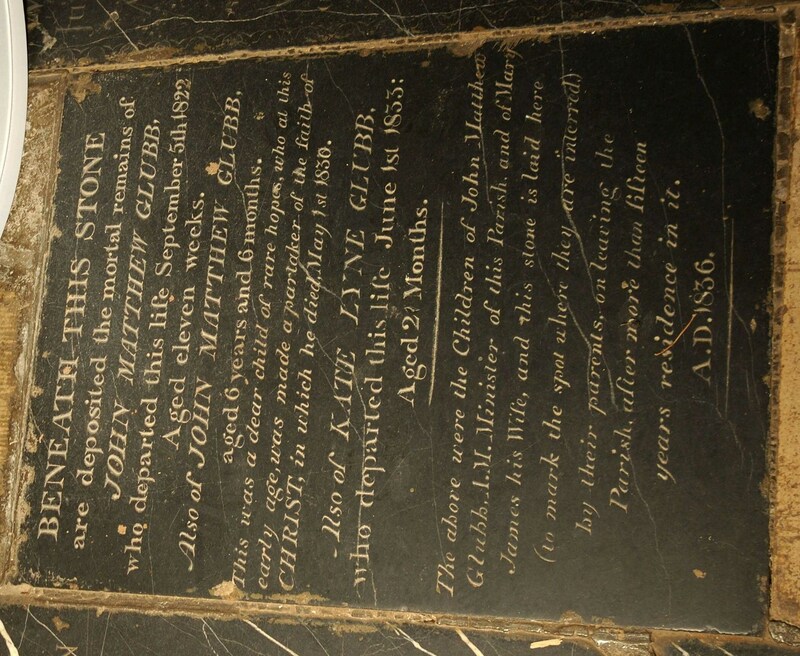 BENEATH THIS STONE/are deposited the mortal remains of/JOHN MATTHEW GLUBB/ who departed this life September 5th 1822/ Aged eleven weeks/ Also of JOHN MATTHEW GLUBB/ aged 6 years and 6 months/ This was a dear child of rare hopes, who at this early age, was made a partaker of the faith of / CHRIST, in which he died, May 1st 1830/Also of KATE LYNE GLUBB/ who departed this life June 1st 1833:/ Aged 21 months. 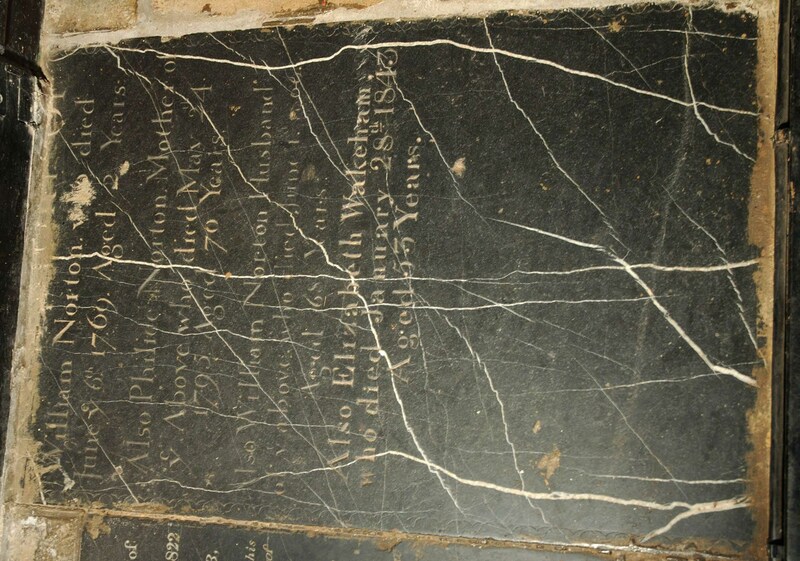 A rectangular stone slab in black marble with white veining with lettering in incised v cut expanded Roman caps and l/c and the first five lines in different and bolder lettering than the remainder. Some damage from cement. 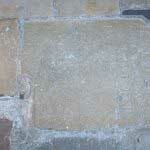 Indication of a scroll motif surround at edge but edges chipped and damaged. 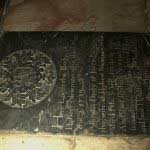 A black marble rectangular slab with incised lettering headed by a deeply incised roundel containing a raised crest on a shield. 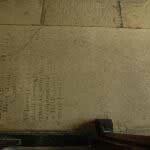 Incised border in line around whole. 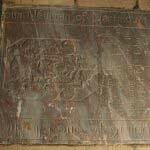 Coat of arms is that of the Brooking family The slab is overlain at its left hand edge by the bench raft and some lettering obscured. Lettering in sans serif caps. 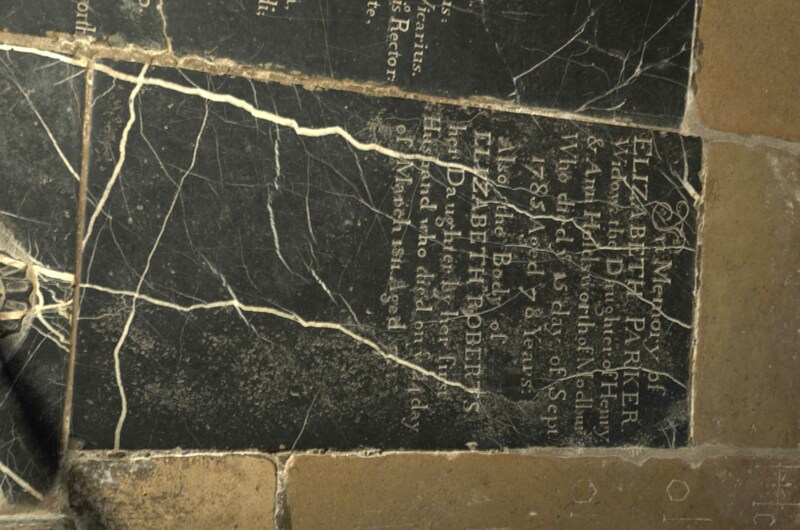 A rectangular black marble Floor Slab with incised lettering in Roman caps and l/c. Long  used. 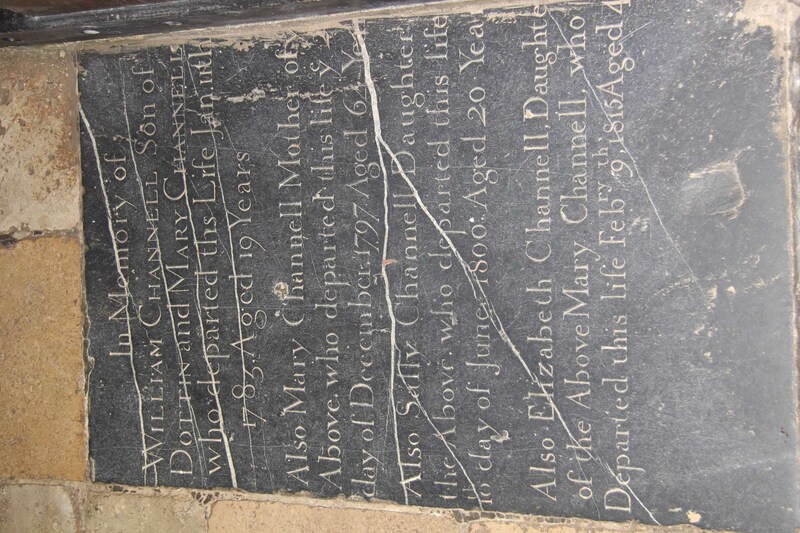 Damaged and date of death of James, unreadable. A rectangular buff limestone slab with incised lettering in Roman caps and l/c. Long ʃ used. Evidence of toothed pattern edging to south edge. 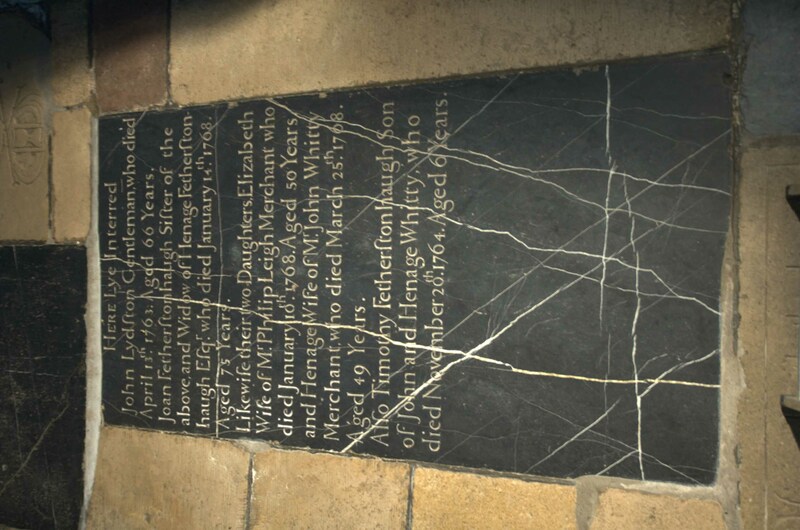 A large rectangular black limestone Floor Slab with incised Roman lettering in Caps and l/c. 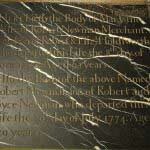 Rectangular slab in buff stone . Lettering in incised Roman caps at head. Broken and part missing. 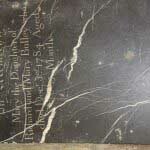 Rectangular stone slab in black marble with white veining. 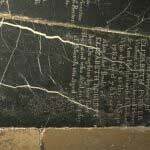 Lettering in incised Roman caps and l/c Broken at head and cracked in many places. 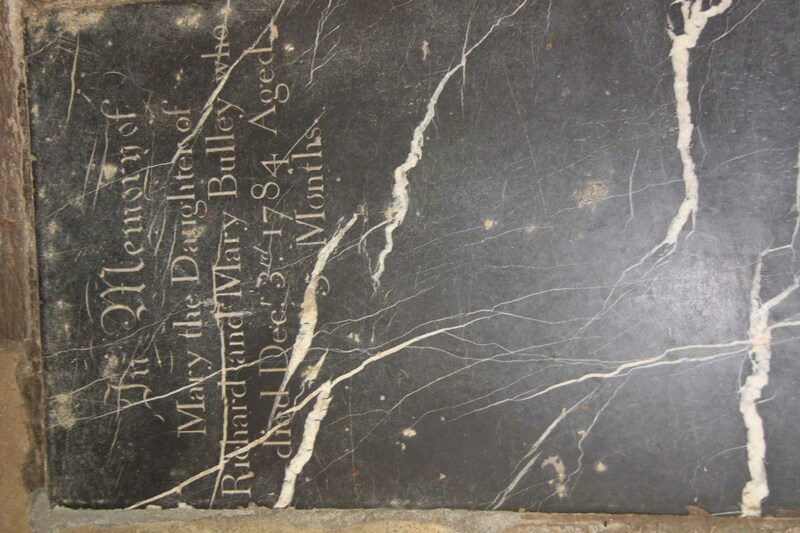 A badly worn rectangular Floor Slab in buff limestone with damaged edges . Inscription in incised Roman caps and l/c . Long ʃ used once. 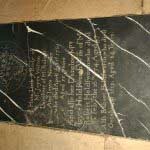 A black marble rectangular Floor Slab with lettering in incised Caps of two sizes. Slightly damaged at foot. 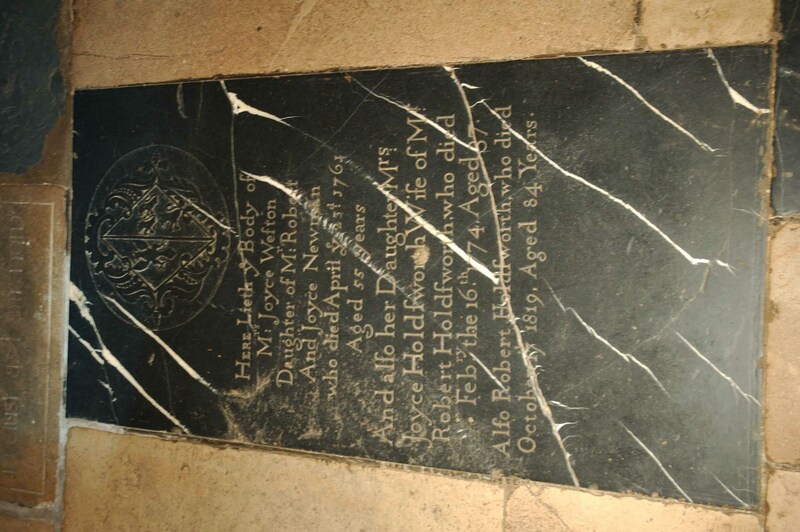 IN MEMORY OF/ARTHUR HOLDSWORTH/GOVERNOR OF DARTMOUTH CASTLE FROM1787 TO 1807/DIED AUGUST 20TH,1807,/AGED75 YEARS./ALSO OF ELIZABETH HIS WIFE/DAUGHTER OF GEORGE and MARY OLIVE/OF POOLE DORSET/DIED APRIL11TH 1775/AGED 39 YEARS/THEY HAD ISSUE/THOMAS ARTHUR. ROBERT. 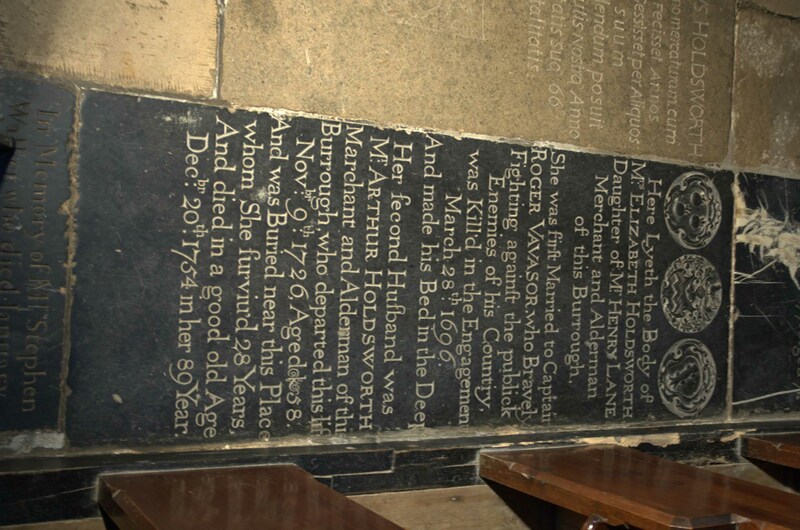 MARIA/DIED IN INFANCY/ELIZABETH DIED JUNE 10TH 1782/AGED 16 YEARS./HARRIET DIED OCTOBER19TH,1788,/AGED 17 YEARS./HENRY HOLDSWORTH./LATE OF HARDNESS HOUSE AND HILLFIELD/ BORN APRIL 8TH 1774/ DIED JANUARY 17TH , 1841,/AGED 67 YEARS. 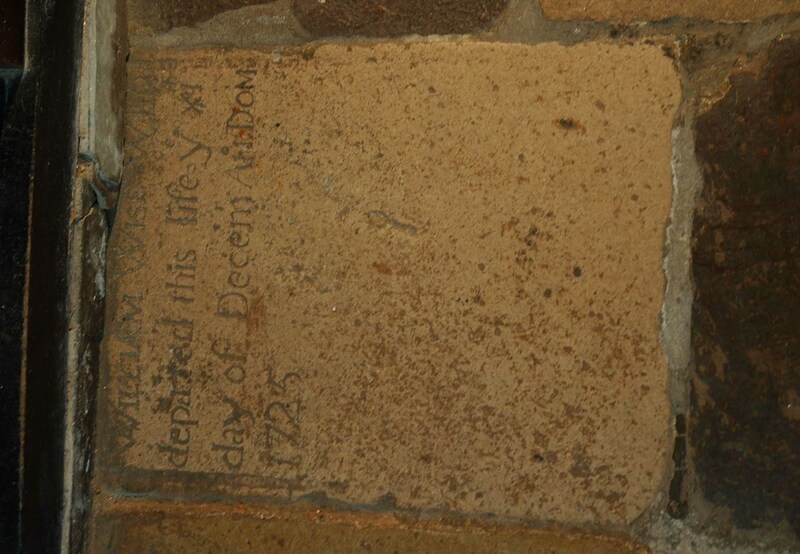 A rectangular buff limestone Floor Slab with inscription in large gothic caps and l/c. Star used instead of horizontal bar in “H” of Here”. 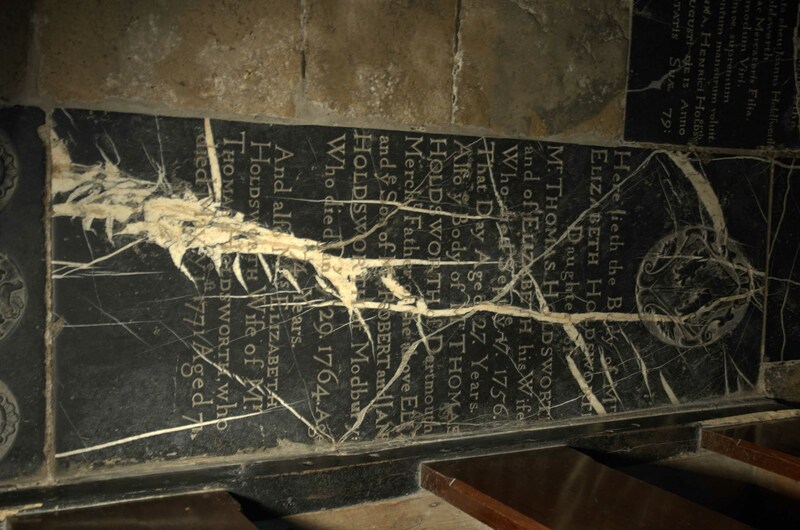 Badly worn at foot which occludes the day of month and year of death. 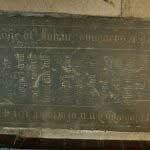 Style typical of others in the Church from 17th c.
A rectangular brass Wall Tablet with inscription in raised Roman caps with the words Samuel Codner appearing in larger caps. 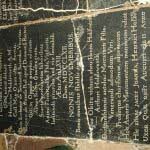 The whole cast as one piece and the inscription in a raised edge surround. Fixed with four slotted dome-headed brass screws one at each corner. 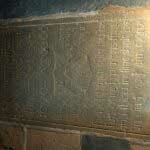 Wall Tablet set on a cement fillet.